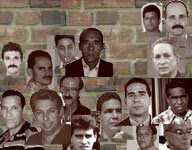 UPDATED, Feb. 19, 2011 — The Cuban Catholic Church announced today that Juan Bermúdez would be released and take exile in Spain. The opponent said that despite the repression, he would be continuing his work for human rights, liberty and democracy in Cuba, and that he would continue going to the Interest Section and its press and culture department, for which he is thankful for the support he has received for his Rosa Parks independent library. This past week, about two dozen people — complete with signs declaring, "Freedom for Juan Bermúdez, "Freedom for the Cuban people," and "Long live human rights" — marched to demand that Bermúdez be released from prison, according to a report from Montes de Oca Martija.